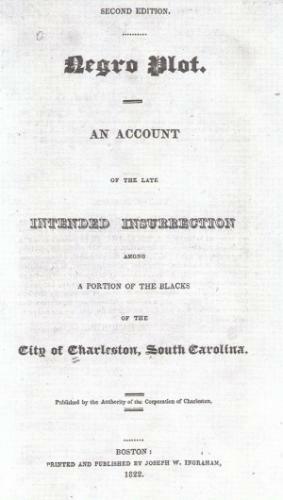 After one loyal slave told his master about a plot to seize the city of Charlestown, South Carolina and kill all the whites, local authorities exposed the most comprehensive slave plot in the history of the United States. More than 1,000 free and enslaved blacks intended to be a part of this uprising which was planned for sometime in July 1822. Denmark Vesey, a free black carpenter and Methodist leader, used his position to organize blacks, who were especially angry about the recent decision to suppress their African Church. South Carolina authorities moved swiftly once the plot was uncovered and Vesey and 36 of his co-conspirators were hanged after a dubious trial. Their executions were accompanied by a massive demonstration of support from defiant free and enslaved blacks that required local militia and Federal troops to restore order. Historical speculation about whether this event was a genuine slave plot or an exaggeration brought on by white panic continues to this day. Evidence brought to the trial indicated extensive correspondence between the accused slaves including names, places, times, numbers, dates and other specific information, all of which points more to conspiracy than unfounded panic among whites. This conspiracy ironically helped politicize black communities throughout the United States particularly after anti-slavery activists began referring to Denmark Vesey as a hero. Frederick Douglass was the first, but not the last, to use Vesey’s name as a battle cry for the first all-black infantry during the Civil War.